There is a spectre haunting the developed world — the spectre of inequality. In the wake of Thomas Piketty’s surprising bestseller Capital in the 21st Century and the disruptive presidential campaigns of Donald Trump and Bernie Sanders in 2016, a consensus seems to have emerged: developed economies are growing more unequal. We went through a golden era in the middle part of the 20th century: economic growth and equality went hand in hand. The rising tide lifted all boats. Then, somewhat unexpectedly, things changed. From 1980 onwards, growth and equality diverged. Disproportionate shares of income went to the top. Today, the incomes of the top 0.1% are incomprehensible. In 2015, the richest 62 people in the world owned more than the bottom 3.5 billion. In 2017, the richest man in the world shattered the glass ceiling of $100 billion in personal wealth. The rise in inequality is generally assumed to be a bad thing. Its effects have been felt most sharply among the middle classes, particularly in the USA. They have lost their steady, well-paying, jobs-for-life. China and automation have seen to that. They are struggling with debt and drug addiction. They feel shut out from politics and political processes. The wealthy buy their way to power and influence. They lobby hard for tax reforms that benefit them the most. The result is an increasingly polarised and violent polity. It’s hard to see any chink of light in this world. Unless you are Steven Pinker. In his recent book Enlightenment Now, Pinker casts doubt on the emerging consensus about inequality. He doesn’t deny the increase, but he calls for greater perspective and critical awareness about what it all means. 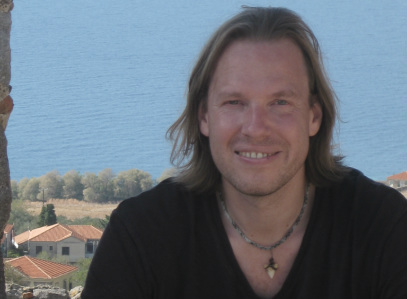 In doing so, he offers two main objections to the emerging consensus: (i) a philosophical objection, which argues that the social/ethical significance of inequality has been overstated; and (ii) a measurement objection, which argues that the statistics that are bandied about in the debate can be misunderstood. In this post, I want to examine both of these objections. I do so in a spirit of self-education and constructive criticism. I’m one of the people who has bought into the emerging consensus. Some of what Pinker says seems quite plausible to me; some less but so. I want to determine which parts of his critique have merit and which do not. That said, I have no desire to engage in the popular sport of Pinker-bashing. Several critical reviews of Pinker’s book have emerged in the past couple of weeks and I’ve been relatively unimpressed by the majority of them. For some odd reason, they all want to challenge Pinker’s interpretation of the Enlightenment and criticise his failure to engage more seriously with Enlightenment thinkers. This seems odd to me since Pinker clearly wasn’t trying to write an intellectual history. His book is about contemporary trends in human society. But, then, perhaps Pinker is a victim of his title. If he called his book ‘Optimism Now’ it might have been more accurate and he could have sidestepped some of this ire (though, no doubt, he would have attracted other kinds). Anyway, these issues are peripheral to this post. I’m not trying to offer an overall evaluation of his book. I just want to focus on the chapter about inequality. Is inequality a bad thing? That depends on what you mean by ‘bad’. Philosophers distinguish between two different senses in which something can be bad. Something can be intrinsically bad, i.e. bad in and of itself. Or something can be instrumentally bad, i.e. bad because of its consequences or effects. If the emerging consensus view is that inequality is a bad thing, in what sense is it bad? Scenario 1: Yourself and two other people are stranded on a desert island. None of you have any resources when you arrive on the island. There is no food or shelter available and the island is exposed to repeated hurricanes. Scenario 2: Yourself and two other people wash up on an island owned by a billionaire businessman. He welcomes you with open arms and allows you to live there. Everyone is given shelter and as much food as they desire, but the businessman prefers you to the others. He allows you to live in his main residence and to play with all his cool toys; he asks the others to live in smaller guest residences and stay away from the main house. Scenario 1 exhibits perfect equality; scenario 2 exhibits considerable inequality. Nevertheless, few people would prefer Scenario 1 to Scenario 2. Why not? The answer is obvious: the equality in scenario 1 comes with a hefty price: it is equality of immiseration only. The argument made by Frankfurt and Huemer is that comparing these kinds of scenarios demonstrates that equality itself is not intrinsically valuable. What really matters is individual well-being. It’s important that people are given enough to survive and thrive, not that they are made perfectly equal. This is a position known as sufficientarianism. It is opposed to egalitarianism and it is Pinker’s philosophical starting point. I try to illustrate its logic in the diagrams below. The ‘sufficiency threshold’ in these diagrams is supposed to illustrate what is intrinsically valuable. 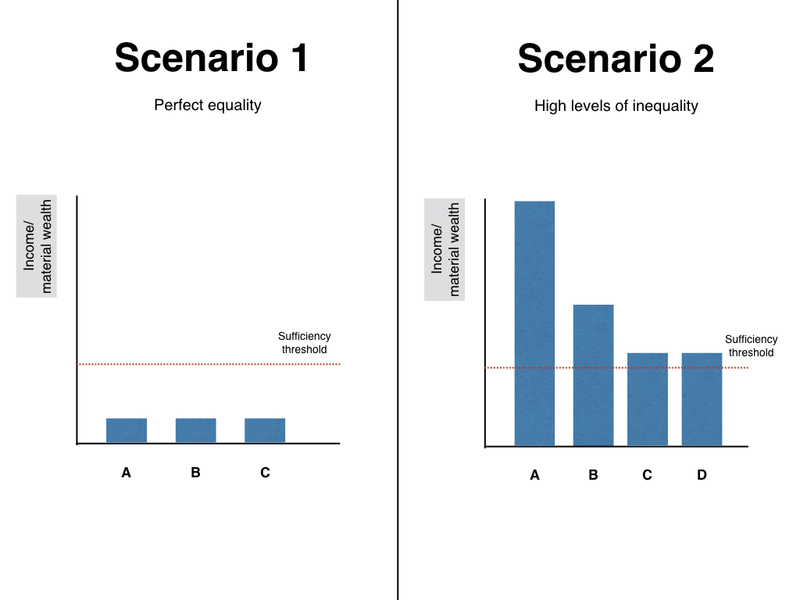 The ‘bars’ indicating the distribution of wealth around that sufficiency threshold represent how equal or unequal the scenario is. The claim is that this lacks intrinsic value. Scenario 3: Same as scenario 2 but when you arrive on the tropical island the billionaire decides to give everyone an equal share of his wealth and equal access to his resources. I think most people would agree that scenario 3 is superior to scenario 2, and one possible explanation for this is that the intrinsic value of equality does matter above the sufficiency threshold. The problem with this is that there are other possible explanations for the superiority of scenario 3 over scenario 2. It could be that equalising wealth has the effect of increasing the overall level of utility or life satisfaction in the relevant world. But I tend to think you could run another version of the thought experiment in which the overall level of utility (above the sufficiency threshold) is kept constant but the distribution of utility is equalised. I think that world would still be better than one in which there is an unequal distribution of utility. This would again suggest that equality has intrinsic value, at least above a threshold of well-being. 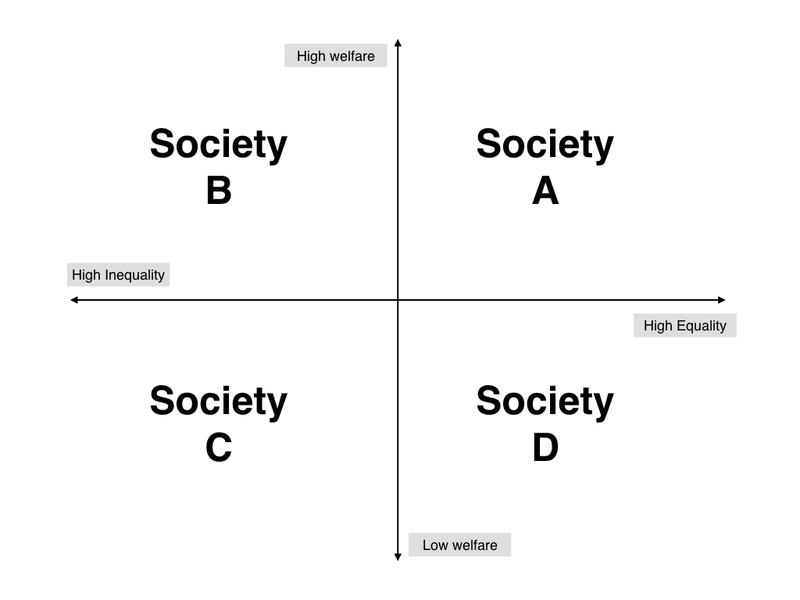 I’ve tried to illustrate this point in the diagram below, suggesting that we must compare the overall merits of a social arrangement along two dimensions: (i) the welfare dimension and (ii) the equality dimension, and that society A is preferable to B, even if B is preferable to C and D.
All of this may be academic, however, because I think Pinker’s larger point is that we do not live in a world in which everyone is above the sufficiency threshold, even though things are getting better, and so bringing people above that threshold should be our priority for the time being. There are other ways to defend the intrinsic value of equality. Some people defend the intrinsic value of equality on the grounds that being treated equally is important in order to respect the agency/capacity of the individual. Shlomi Segall, for example, has argued that inequality in outcomes is intrinsically bad whenever it results from forces beyond the individual’s control. This implies that inequality might be tolerable when it results from forces within the individual’s control. What matters is that individual effort and responsibility determine one’s share in the social surplus. When this is not the case, inequality of outcomes is intrinsically bad. Pinker has a response to this, although he does not flag it as such. He argues that this kind of critique results from a conflation of concepts. Specifically, he thinks people who make it are confusing inequality with theft or unfairness. Just because one person is richer than another does not mean that the former stole from the latter. Pinker uses the example of JK Rowling, author of the Harry Potter books, to make this point. She made a lot of money from those books, but she didn’t steal from anyone in the process, and the people who bought her books enjoyed them (or, at least, the majority did). She certainly gained a lot, but they all gained something too. It was a positive sum game in which more of the surplus flowed to her than to the individual readers. But there was no theft or underhand tactics involved. To bolster this point, Pinker cites experimental studies suggesting that people are content with unequal distributions of this sort, if they result from people getting what they deserve. If those who put in more effort get more in return, people seem to be happy with this. I agree with Pinker that it is important to keep inequality conceptually distinct from theft and fairness. But it would be foolish to deny that they are often connected and that on at least some occasions inequality does result from theft or unfairness. Indeed, I take this to be one of the key arguments against current manifestations of inequality in the Western world. As Piketty points out in his discussion of income inequality, it is difficult to explain the high incomes of the CEOs of large corporations in meritocratic terms. It is highly improbable that they deserve to take home 50 to 100 times the salary of their workers. They certainly don’t add that much extra value to the output of their firms (this is obvious when you consider that financial CEOs still earned huge sums during the worst of the financial crisis). It’s more likely that they are taking an unfair share of their firm’s profits. This seems to be borne out by other evidence. Andrew Weil, for example, in his excellent book The Fissured Workplace argues that the increased use of precarious, outsourced, platform labour by companies results in an unfair distribution of the benefits and burdens of economic productivity. It is something that makes life much worse for most workers (less pay, less benefits, less security) and much better for company managers and shareholders (who take a greater share of firm profits as a result). The one moderating effect is that it may also make things better for consumers by charging them cheaper prices. Pinker makes much of this moderating effect, which we’ll return to later. Overall then, Pinker thinks that concerns about inequality need to be put in their place. Inequality is not intrinsically bad, nor is it to be conflated with theft and unfairness. You could have perfectly equal societies in which everyone suffers terribly; and highly unequal societies in which everyone thrives. We should prefer the latter to the former. This is because individual welfare and well-being are the true intrinsic goods and count for far more in our moral deliberations. I agree with the overall spirit of this, but I would argue (a) that inequality might still be an intrinsic bad, just one that only becomes significant when societies cross a threshold of well-being; and (b) that some of the inequality we currently see in developed economies is caused by theft/unfairness. Gini Coefficient: This is a measure of the statistical dispersion of values in a frequency distribution. Though it can be used to measure different types of statistical dispersion it is most commonly used to measure the dispersion in the values of incomes earned across a society. The Gini Coefficient is expressed as a number between 0 and 1. A society that scores 0 on the Gini coefficient is one of perfect equality, i.e. everyone in the society earns the same; a society that scores 1 is one of perfect inequality, i.e. one person gets everything. Developed economies typically have Gini coefficients that range from about 0.25 to 0.50. Income Shares: This is a measure of the proportion of total income earned by different income cohorts across a society. The cohorts occupy different deciles or centiles in the distribution of incomes. If you have paid attention to recent debates about inequality you will be familiar with this lingo. It’s where all the talk of the top 10% or 1% comes from. What those labels mean in practice is that the top 10% (top decile) are those whose incomes that fall within the top 10% of the range of incomes; and the top 1% (top centile) are those whose incomes fall within the top 1% of the range of incomes earned. These cohorts can take different overall shares of the total income earned in a society in a given year. For example, Piketty presents data in his book suggesting that the top 10% of the income distribution in Europe take about 35% of the total income, whereas in the USA they take 50% (circa 2010). (a) Relative measures vs Absolute measures: The inequality figures track relative differences between people within a society not absolute differences. This gets back to his main philosophical objection. He thinks that how people are doing relative to one another is less important than how people are doing individually (i.e. in terms of their personal level of well-being). He thinks that poverty — which is usually measured in absolute terms (*though some countries use relative measures) — is a far more important measure than inequality. This seems to have been going down over the past fifty years. (b) Global Inequality vs Developed World Inequality: The inequality figures reported by the likes of Piketty offer a biased snapshot of the global situation. If you look at measures of inequality across all countries, you see that there has been a marked decline. The increase is only seen in developed economies. The diagram below, which is taken from Pinker’s book, illustrates this point. 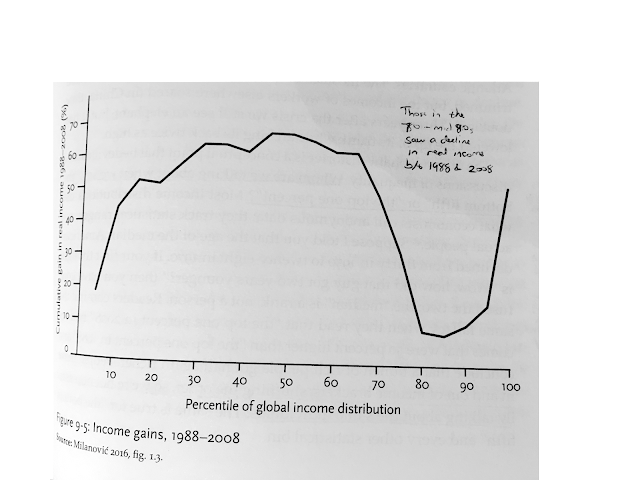 It shows the percentage gain in real income across the different percentiles of the global income distribution between 1988-2008. As you can see, most income cohorts gained substantially in that period. It is only those in developed countries, who are between the top 30% and top 10% of the global income distribution who did not gain substantially (though they did gain something). They are now, relatively, worse off than their peers, particularly those in the top 10% in plight is real and should not be ignored, but it should be kept in perspective. (c) Anonymous vs Individualised Measures: The measures, particularly the income share measures, do not track particular individuals across their lifetimes but, rather, track abstract income cohorts in any given year. This is important because the data consequently don’t account for income mobility, i.e. the ability of people to move from one income cohort to another. Pinker cites a study showing that half of all Americans find themselves within the top 10% for at least one year in their lives, which might be taken to indicate that income mobility is not so bad. (d) Measures sometimes overlook the effect of social transfers: Most developed economies operate reasonably generous welfare systems. This corrects for some of the inequality in earned income and means that the situation of those in the bottom end of the income distribution may not be as bad as is first thought. When trying to assess the overall level of inequality it is important to include the effect of social transfers. For example, Pinker cites a study indicating that the US Gini coefficient was a relatively high 0.51 in 2013 before taxes and transfers, but a more moderate 0.38 after taxes and transfers. (e) Measures ignore the impact of abundance economics: Inequality measures do not account for the effects of technology and globalisation on the volume, availability and cost of goods and services. This is one of Pinker’s main points in the book. He argues that globalisation, by reducing the cost of goods and services, increases their affordability even for those on very low incomes. Furthermore, he argues that gains in technology mean that people have access to luxuries that were formerly not available. 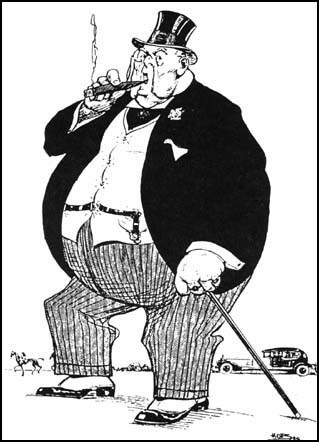 As he puts it “a dollar today, no matter how heroically adjusted for inflation, buys far more betterment of life than a dollar yesterday.” (2018, 117) The lifestyles of those on moderate incomes today would have been envied by aristocrats in a former era. Each of these points has some merit. It is undoubtedly true that inequality statistics must be interpreted sensibly. The mere fact that inequality is increasing in developed nations does not mean that the world is going to hell in a handbasket; and there are subtleties in the data that are easily glossed over. But I also think that Pinker’s criticisms of the statistics have to be interpreted sensibly too. While points (a) and (b) seem relatively sound to me, my reading of the literature suggests that points (c) - (e) are less compelling. Inequality researchers are not idiots and they have tried to address these points. The picture that emerges from their attempts to do so, indicate that things are less rosy than Pinker lets on. For example, recent studies on income mobility are not entirely encouraging. Admittedly, a lot of this depends on how you define mobility. Jonathan Hopkin makes this point in relation to a 2014 Harvard study on social mobility which suggested that mobility had not changed much in the US in the past 50 years. The problem with this is that the study focused on mobility between different income cohorts, not on changes in how much income was earned by those cohorts. So, for example, the study showed that those who were born into the bottom 20% of the income distribution had an 8-9% likelihood of joining the top 20% in their lifetimes (not an altogether encouraging stat, even on face value), and that this figure hadn’t changed much since the 1970s. But this ignored the fact that the gap between incomes at the top and bottom has grown in this period of time, meaning that the starting difference counts for more than it did in 1971. In other words, we should be more concerned about the relative lack/ease of mobility nowadays due to stratification. On top of this, a more recent study from Raj Chetty and his colleagues suggests that ‘absolute income mobility’ in the US — i.e. the percentage of children earning more than their parents — has dropped quite dramatically when you compare children born in the 1940s with those born in the 1980s (from 90% to 50%). In a similar vein, recent studies on the effect of social transfers on inequality are not entirely encouraging. Gabriel Zucman, writing with Thomas Piketty and Emmanuel Saez, has just published a paper that tries to assess the impact of social transfers on income inequality. It finds that the overall effect is negligible, doing very little to offset the massive increase in income inequality between the bottom 50% and the top 10%. The paper argues that the bottom 50% did see a 21% increase in post-tax income between 1980 and 2014, but this increase was less than the increase in national income (and should be compared to a 205% increase in income to the top 1% during the same period). Furthermore, real incomes after tax actually stagnated because most of the transfers went to the elderly and middle classes, and came in the form of in-kind health spending or public goods spending. Finally, although I am sympathetic to Pinker’s point about abundance economics, I think it too needs to be kept in perspective. There have undoubtedly been technological gains, and some things that have become cheaper and more abundant. But there are also some things that have massively increased in price. The obvious examples of this are healthcare, education, and housing. These increases are not insignificant. They are leading to the immiseration of younger generations who now graduate from college with increased levels of personal debt only to work in an economy that doesn’t provide jobs with the same kinds of health benefits that their parents enjoyed and doesn’t pay enough for them to be able to afford housing in the urban centres in which they are employed. In sum, Pinker is right to urge caution with respect to inequality statistics. You need to know what they actually tell you to keep the information in perspective. Nevertheless, even if you take his observations onboard, I think there are reasons to think that the picture is less rosy than he claims. According to the emerging consensus, inequality is increasing in developed economies and this is a bad thing. In this post, I have considered Steven Pinker’s criticisms of that emerging consensus. Although Pinker does not dispute the rise of inequality, and accepts that it creates serious problems in some societies, he thinks those problems need to be kept in perspective. This is partly because inequality is not intrinsically bad and its presence does not mean that you live in an unfair society (the Philosophical Objection); and it is partly because inequality statistics can be misunderstand (the Measurement objection). I have evaluated both objections in this post. Although I agree with parts of what Pinker has to say, I think there are reasons to believe that inequality is intrinsically bad, and that its badness becomes more significant when you achieve a certain level of societal well-being. Furthermore, I think his critique of inequality measurements is not entirely fair. Researchers have addressed some of the issues he raises and when they do the picture is not as positive as he claims. Interestingly, Piketty addresses the issue of income mobility in his book, providing a number of references supporting its irrelevance.